An educator, Ms. Jing Yu, and the professional violinist, Mr. Edmund Wu who's had 22 years of teaching experience, founded AMAC in 1995. In the past 12 years, under the guidance and nurturing of their founders and over twenty excellent musicians (teachers), hundreds of AMAC students were developed into young promising musicians and excellent students in their school each year. Majority of the students are from Arcadia area, however, some travel from Pasadena, Diamond Bar, Hacienda Heights, Fullerton, Brea and Claremont areas. Many of them become the backbones of their respective orchestras. 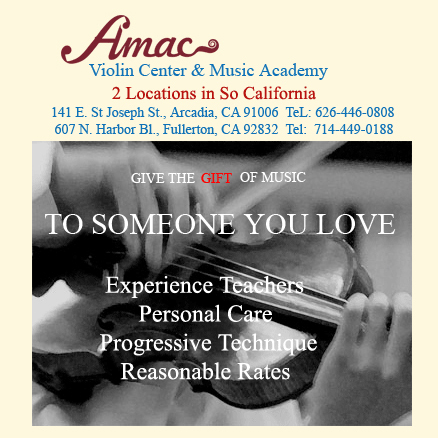 AMAC Violin Center and Music Academy also provides CM exam (MTAC Certificate of Merit) at our facility each year in the month of March. Two Music Festivals, Christmas Concert and Satori String Contest. Spring Festival in the month of February gives the opportunity to the students to warm-up for their CM exam and Summer Festival preparing the students who are joining the Satori String Contest. All AMAC teachers have more than ten years of teaching experience. The best location: Two blocks north of Huntington Dr and two blocks south of Colorado Blvd. One block north of Arcadia 24 Hour fitness. Between 1st and 2nd Ave. In the past years we have many students have won all kinds of performing awards in the greater Los Angeles area. Provide string quartet, duets, trio classes to enhance students performing ability. Provide all levels theory classes for the CM examination. Two Music Festivals every year in the months of February (Spring Festival) and July (AMAC Music Festival). We provide recitals regularly to give the opportunities for students to perform in the public.